The black cotton twill covered Coccyx Wedge Cushion has been designed to improve your posture and to offer relief to those who suffer with a tender coccyx. The 11 deg. angle is accepted as producing the optimum sitting position and correct posture. The cut-out at the back of the cushion allows the coccyx to be suspended without pressure. The construction of the cushion includes both standard foam and a generous 2 cm layer of high sensity memory foam for improved comfort. 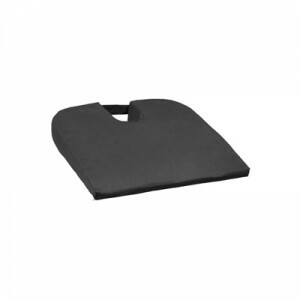 The Coccyx Wedge Cushion can also be used in a car seat as an infill.